Be Sure And Subscribe Up At The Top Of The Page! scroll down & click on "Comments" and/or click on a button below to share this page via Facebook™, email, or your favorite blog, social media, or bookmark service. Two million views and counting. Watch it and forward the link before you vote. "A new, 18-minute mini-documentary follows the journey of Irina, a 23-year-old liberal, Jewish New Yorker who voted for Obama in 2008. Yet as her connection to Israel has grown, and she has learned more about the President's policies across the Middle East and towards Israel in particular, Irina has come to realize that "when the chips are down," the President may not "have Israel's back" as he says. Clips from longtime Democratic supporters including: Harvard Professor Alan Dershowitz Former NYC Mayor Ed Koch Senator Joseph Lieberman (I-CT) Senator Bob Menendez (D-NJ) Rep. Eliot Engel (D-NY)"
The Empty Podium...Romney Eats Obama's Lunch. 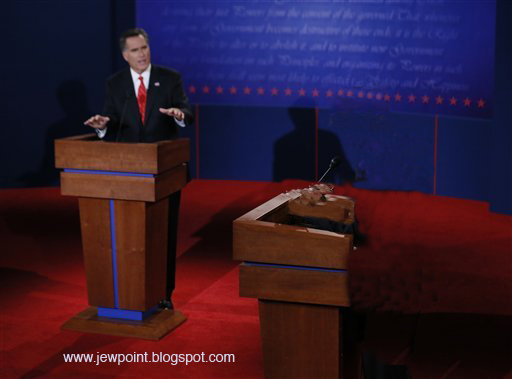 EDITED October 4, 2012; video and additional "photos" of and comments about the debate. A video of excerpts, some comments, and "captions" about the debate. "It is that, you, we — we own this country. And — so — they are just going to come around and beg for votes every few years. It is the same old deal. But I just think it is important that you realize , that you’re the best in the world. Whether you are a Democrat or Republican or whether you’re libertarian or whatever, you are the best. And we should not ever forget that. And when somebody does not do the job, we got to let them go." -Clint Eastwood at the RNC, Oct. 30 2012. Read more from "Ten Things to Know About Denver Debate Last Night". In our opinion, Romney appeared to be looking at Obama with a father's pity, when he realized what a public spanking Obama was taking. click on a button below to share this page via Facebook™, email, or your favorite blog, social media, or bookmark service. Enter your email address for 1-2 emails per week for the latest on JewPoint. Your email address will never be sold or given out. 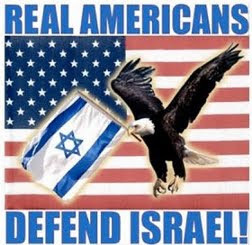 And Real Jews DEFEND AMERICA. Read "You've Won A Jihad Pass!" Don't Leave Home Without It: Print Your "Flying While Jewish" card. Please see the full Fair Use and Comments Disclaimer at the bottom of this page. Constructive, interesting, humorous and/or relevant comments are welcome, along with trackbacks. Please do not link to or excerpt 3rd party copyrighted material in your comments unless you are quoting less than 50% of the original and providing a link and full attribution to the source. Please do "subscribe" via the sign-up box at the top, and please do click a "Share" icon at the end of any article or image you wish to share via email, Facebook or other blogs or social media. Non-constructive remarks, spam or hatemail will be deleted. The content of posts on this site, including but not limited to links to other web sites, are the expressed opinion of the original poster and are in no way representative of or endorsed by the owners or administration of this website. The posts on this website are the opinion of the specific author and are not statements of advice, opinion, or factual information on behalf of the owner or administration of Jewpoint. This site may contain adult language, if you feel you might be offended by such content, you should log off immediately. and do their own follow up research while reading and posting on this website. Jewpoint reserves the right to make changes to, corrections and/or remove entirely at any time posts made on this website without notice. In addition, Jewpoint disclaims any and all liability for damages incurred directly or indirectly as a result of a post on this website. This site is provided "as is" without warranty of any kind, either expressed or implied. You should not assume that this site is error-free or that it will be suitable for the particular purpose which you have in mind when using it. In no event shall Jewpoint be liable for any special, incidental, indirect or consequential damages of any kind, or any damages whatsoever, including, without limitation, those resulting from loss of use, data or profits, whether or not advised of the possibility of damage, and on any theory of liability, arising out of or in connection with the use or performance of this site or other documents which are referenced by or linked to this site. This site may contain copyrighted material the use of which has not always been specifically authorized by the copyright owner. Users may make such material available in an effort to advance awareness and understanding of issues relating to politics, culture, economics, individual rights, international affairs, liberty, science & technology, etc. We believe this constitutes a 'fair use' of any such copyrighted material as provided for in section 107 of the US Copyright Law. In accordance with Title 17 U.S.C.Section 107, the material on this site is distributed to those who have expressed a prior interest in receiving the included information for research and educational purposes. In accordance with industry accepted best practices we ask that visitors who post comments limit their copy / paste of copyrighted material to the relevant portions of the article you wish to discuss and no more than 50% of the source material, provide a link back to the original article and provide your original comments / criticism in your post with the article. Please remember YOU are responsible for what YOU post on the internet and YOU could be sued by the original copyright holder if you do not honor these rules. If notice is given of an alleged copyright violation we will act expeditiously to remove or disable access to the material(s) in question. It is our strict policy to disable access to accounts of repeat copyright violation offenders. All 3rd party material posted on this website is copyright the respective owners / authors. Jewpoint makes no claim of copyright on such material.